Some employees have been provided with a version of OS X 10.9.2 identified as build 13C64, people familiar with the matter told AppleInsider on Monday. The forthcoming update includes the usual security fixes, but also adds a number of new features to Mavericks, most notably the ability to make and receive FaceTime audio calls. Update: One person with access to the prerelease build confirmed to AppleInsider that the latest version of OS X 10.9.2 does patch the so-called "goto fail" SSL security flaw. 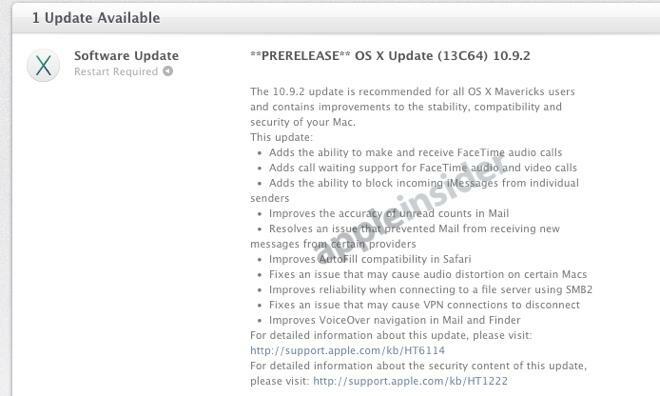 OS X 10.9.2 will also add call waiting support for FaceTime audio and video calls. The Messages application in OS X will also gain the ability to block incoming iMessages from individual senders. Internal release notes provided to employees also indicate that the update improves the accuracy of unread messages counts in Mail. The update is also expected to resolve an issue that would prevent Mail from receiving new messages from certain providers. To date, Apple has supplied developers with seven betas of OS X 10.9.2, the most recent arriving one week ago. That prerelease beta was identified as build 13C62, while the latest prerelease version supplied to Apple employees is a slightly newer build. The accompanying release notes offer no indication that the prerelease build of OS X 10.9.2 patches a newly exposed SSL security flaw that was addressed in an update to iOS last week. Apple has promised that a fix for the OS X issue will arrive "very soon."